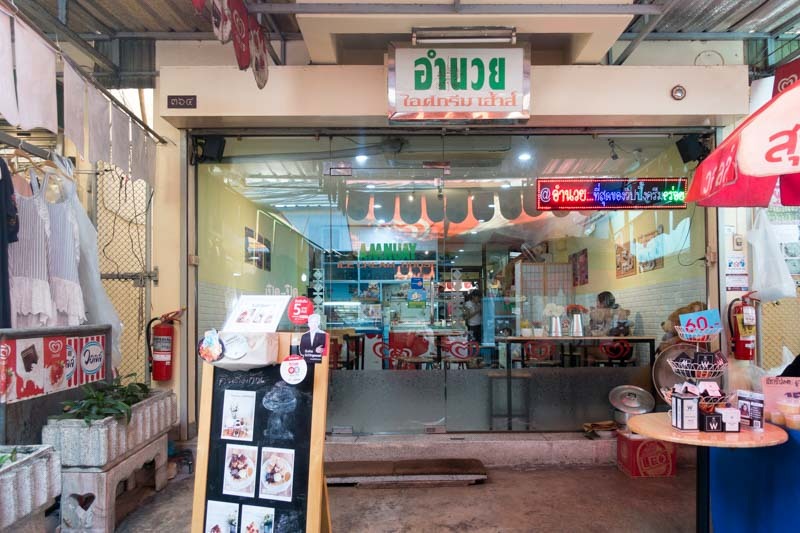 Unbeknownst to tourists and throngs of Insta-hungry travellers because of its ulu location, Wang Lang Market is a hidden gem tucked away along Chao Phraya River at Siriraj, Bangkok. 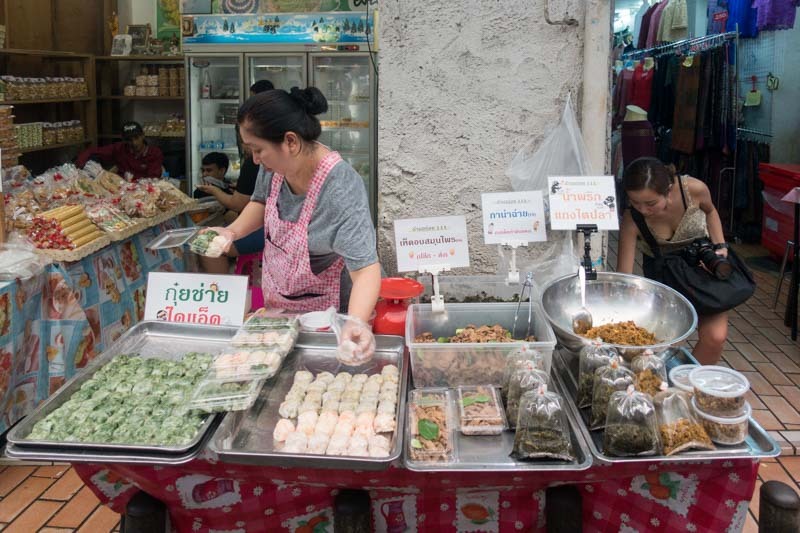 Locals adore this spot because of its amazing street food, cheap shopping deals and variety of delicious snack stalls. 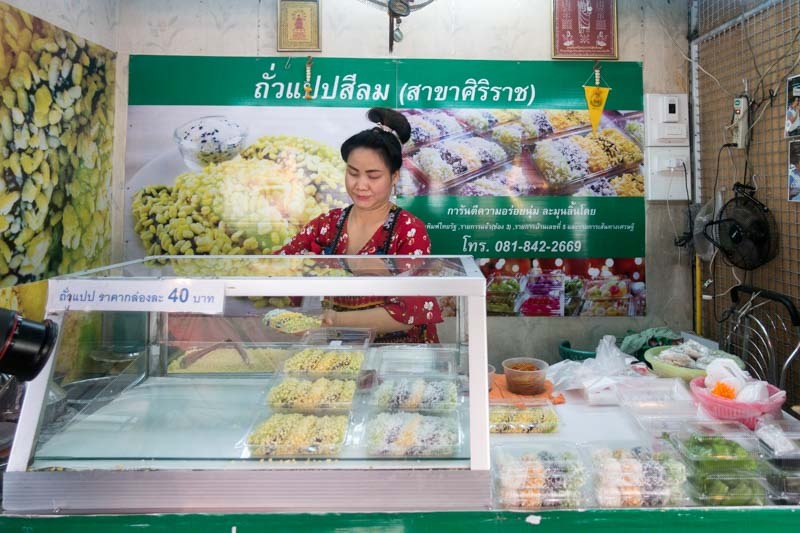 Plus, it’s a day market that’s open from 6am – 8pm, so if you’re looking to visit an authentic Thai market during the day, Wang Lang Market is definitely for you. Getting there is can be quite tricky. We took a taxi and our driver dropped us at a random spot along the roadside, and told us to enter the market through any visible alley. You can also reach Wang Lang Market by boat at Sathorn Pier, which is at Saphan Taksin BTS. 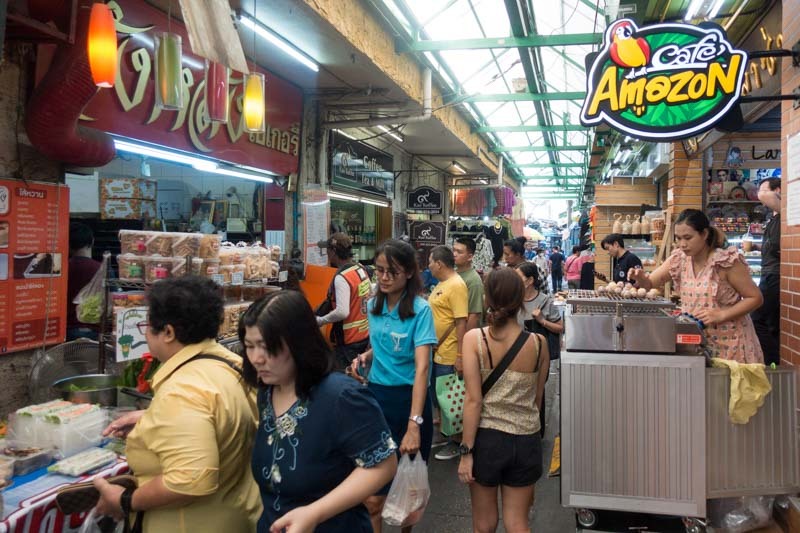 As compared to other popular tourist markets like Chatuchak or Rot Fai Ratchada where you have pop-up stalls strategically lined up in neat rows or sections, Wang Lang Market is more difficult to navigate. 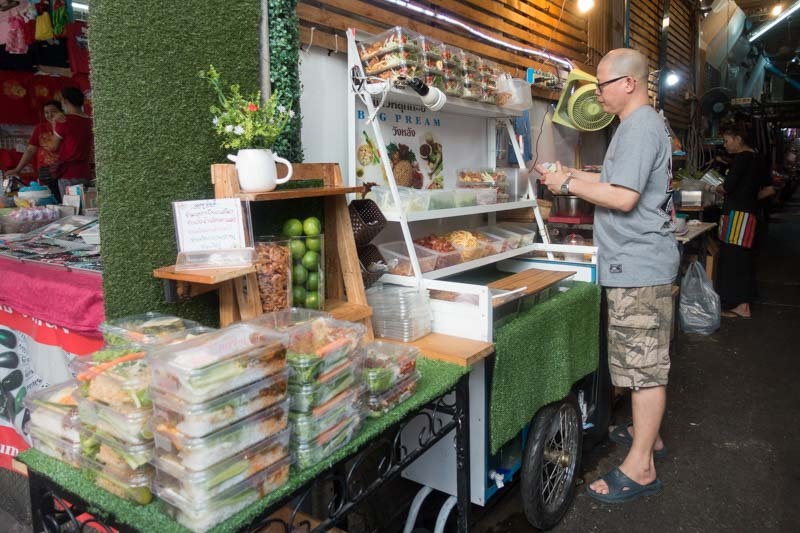 Think of sprawling series of alleys that have no definitive start or end, where one narrow pathway leads to another section of shops and restaurants. If that sounds like a challenge for you, that’s where we come in handy! 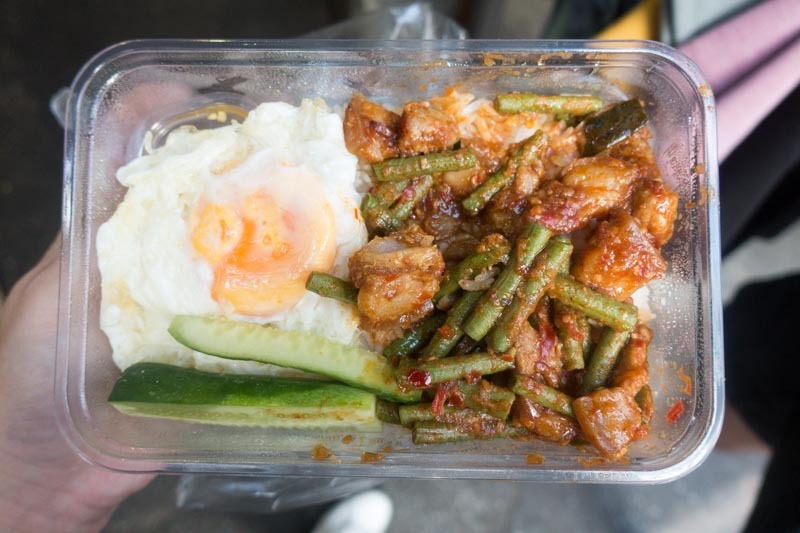 We trawled the entire market to bring you 10 street foods you should definitely check out when you’re at Wang Lang Market. If you’re one to grab food and eat it on the go, these ready-made bento sets are perfect for you. At THB50 per box, they’re affordable and filling. Plus, the stall we visited had a wide variety of sets, such as Thai pork basil rice, brown rice with fish and chicken fried rice. This was definitely more popular with the locals (especially students) who were rushing to buy a quick lunch and head back to school or work. 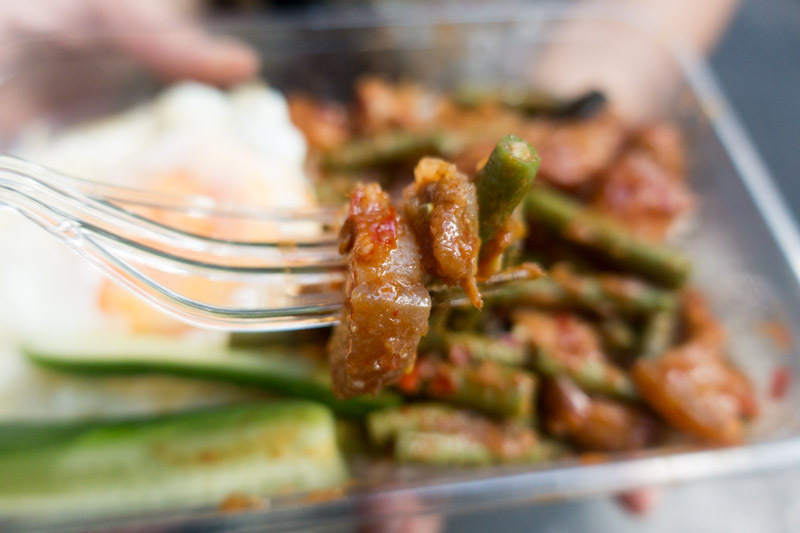 We got the spicy long bean pork belly rice, which came with an egg and a couple of slices of crisp cucumber. For its affordable price, which is about S$2, I was super happy to see a large portion of long beans and pork belly. This was absolutely amazing. I loved that the long beans and pork belly were cut into tiny pieces so you could just scoop it up and eat it right away. The pork belly was tender and soft, and the spicy sauce was piquant and slightly sweet. It tasted just like Singapore’s sweet chicken rice chilli, but with a hint of chilli padi that left a fiery but pleasant aftertaste. I was also pleased to note that the egg was perfectly done. The egg whites were firm but the yolk was gorgeously runny. 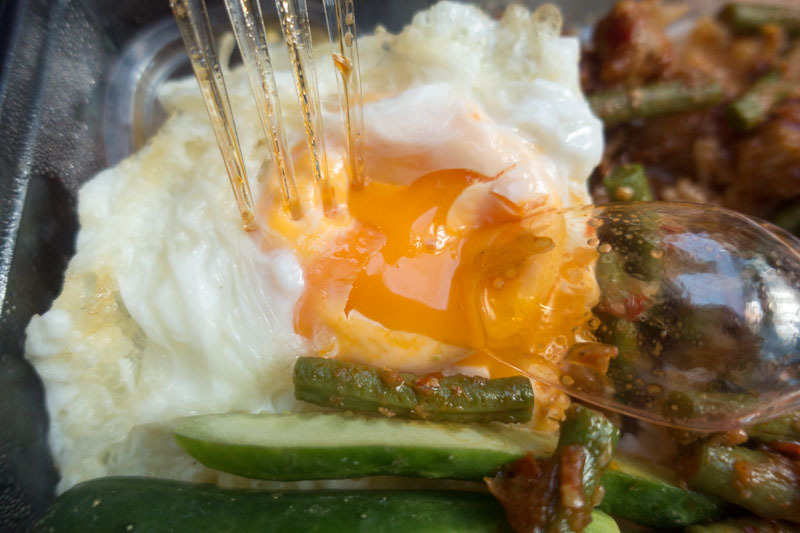 I ended up breaking the yolk and mixing it together with the rice, spicy pork belly and long beans, and downed the entire box within minutes. 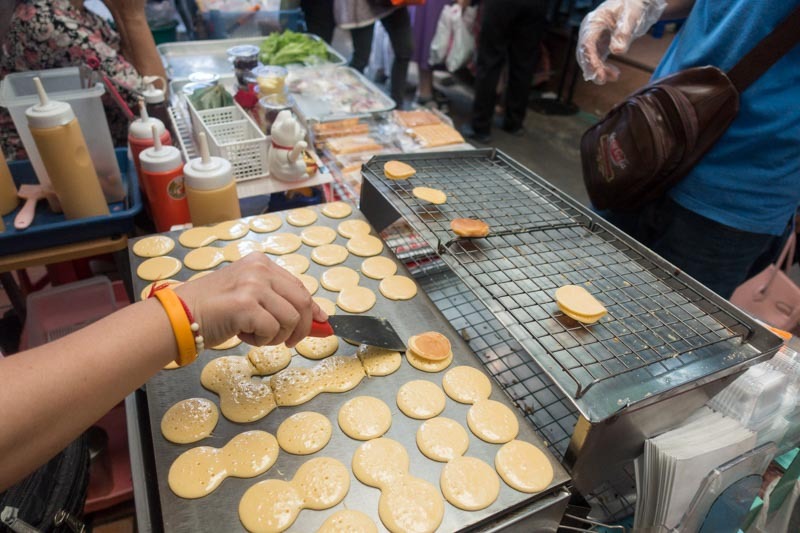 This stall definitely piqued my interest because I’ve never seen such tiny pancakes in my life — they were only slightly larger than a S$1 coin! You won’t miss this stall for sure; I only spotted one vendor selling tiny pancakes and he was located visibly along one of the larger alleys in Wang Lang Market. We got the smallest box for THB20, but if you’re feeling peckish, you can also get the medium and large sizes, which are THB30 and THB40 respectively. 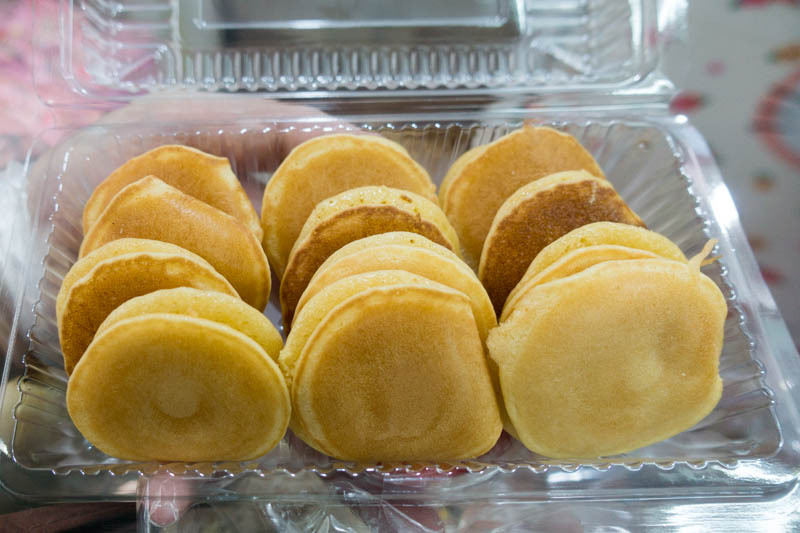 For THB20 (which is slightly less than S$1), we got 12 tiny pancakes. What a steal! 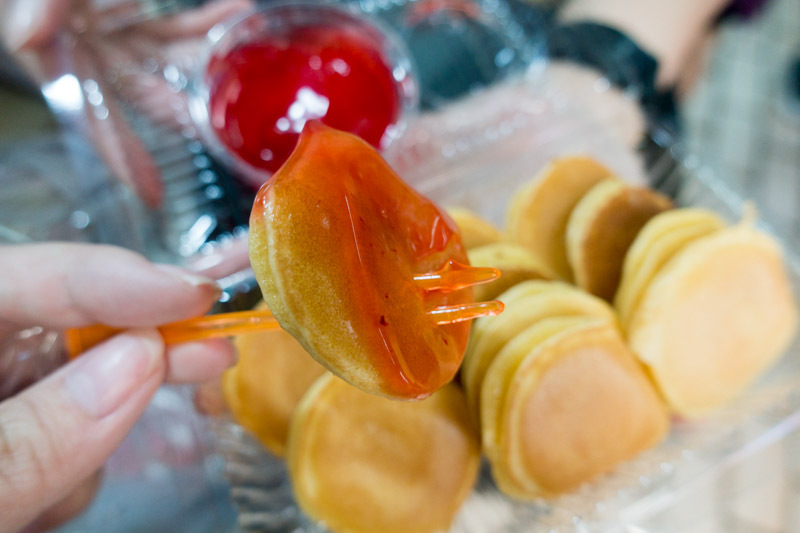 You can pick between vanilla, chocolate and strawberry jam to accompany your tiny pancakes. On its own, the tiny pancakes were a little plain but it went great with the sweet strawberry jam, which was more like a syrup. These tiny pancakes reminded me of waffles because of how simple and indulgent it was. The bite-sized pieces were easy for me to wolf down too. Fluffy and spongey, the tiny pancakes were addictive and it’s something I would totally binge on while watching the latest drama on Netflix. 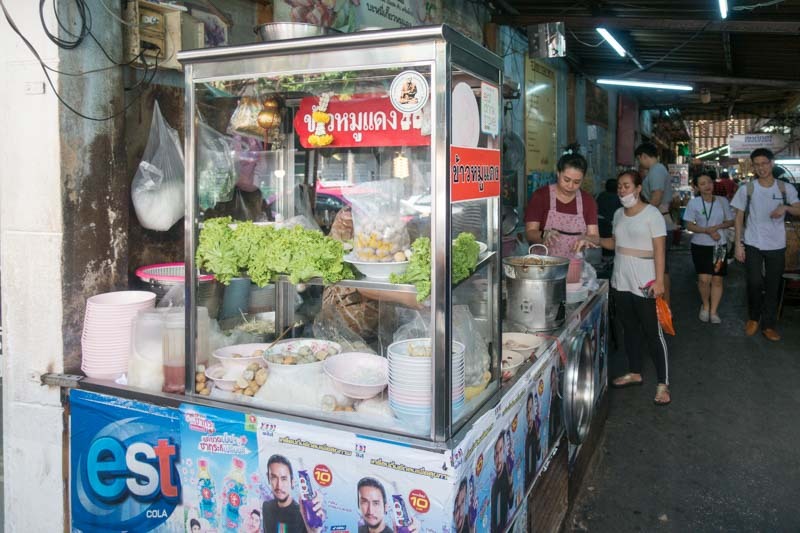 Because Wang Lang Market is a day market that opens from 6am, it’s littered with plenty of stalls that sell breakfast food, such as kaya toast and Thai iced milk tea. 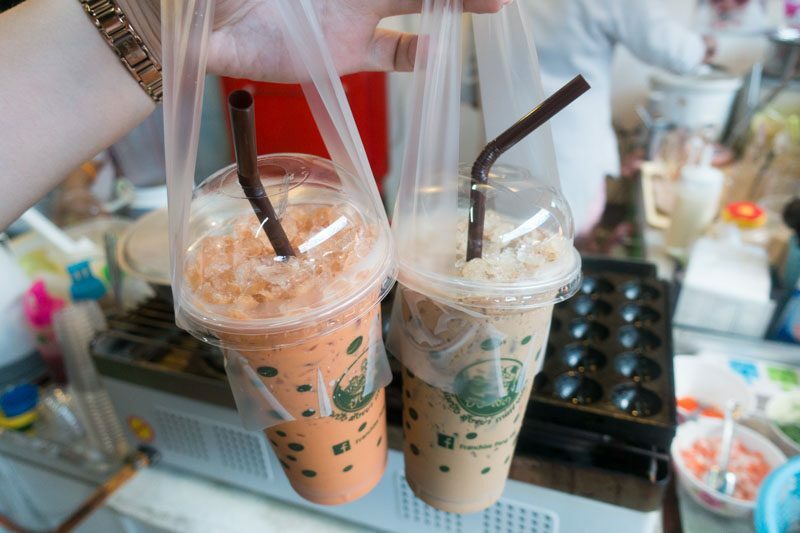 The drinks came in one size (which was huge, by the way) and we ordered two drinks — Thai Iced Milk Tea (THB25) and Iced Coffee (THB25). While the Thai Iced Milk Tea was a little too sweet for my liking, I really loved the Iced Coffee. I could taste a slight bitterness from the roasted coffee beans while the addition of condensed milk made the coffee fragrant, light and smooth. Tip: if you’re not a fan of overly sweet drinks, ask for less condensed milk or sugar when ordering. 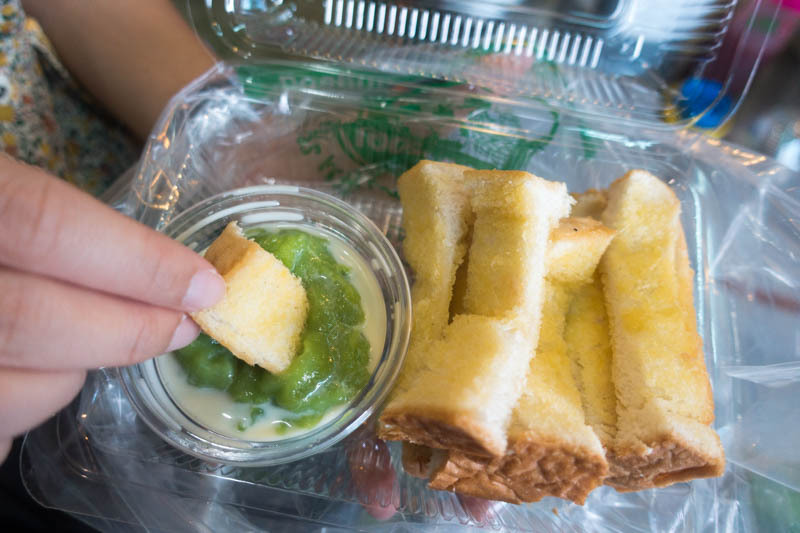 The same stall also sold Kaya Toast (THB30). The vendor buttered the bread generously and popped it in the toaster upon order. I was super happy to see that because it meant that our toast would be freshly-made, hot and perfect for dipping into that kaya spread. I loved this kaya toast and I could have this for breakfast every day. The toast was delightfully buttery on the outside and slight crisp, but the inside was still fluffy and soft. Plus, I noticed that the toast they used was slightly thicker than the regular sliced bread. The kaya dip was sweet and honey-like, with a rich pandan taste. My only gripe would be that the dip was a little watery because the coconut milk had been added separately, and I had some trouble scooping the kaya up with the toast. We found this particular beef noodles stall near the main road and the smell of its beef broth was absolutely mouth-watering. Piquant and slightly peppery, it was undeniably the perfect comfort food on a rainy day. The one thing I’ve got to say about Thailand is that the Beef Noodles (THB80) is fantastic. Unlike Singapore’s rendition of beef noodles which can be a little heavy with thicker gravy, this particular bowl of beef noodles was light. It’s still packed with umami flavours, with just the right amount of salt, oil and herbs. 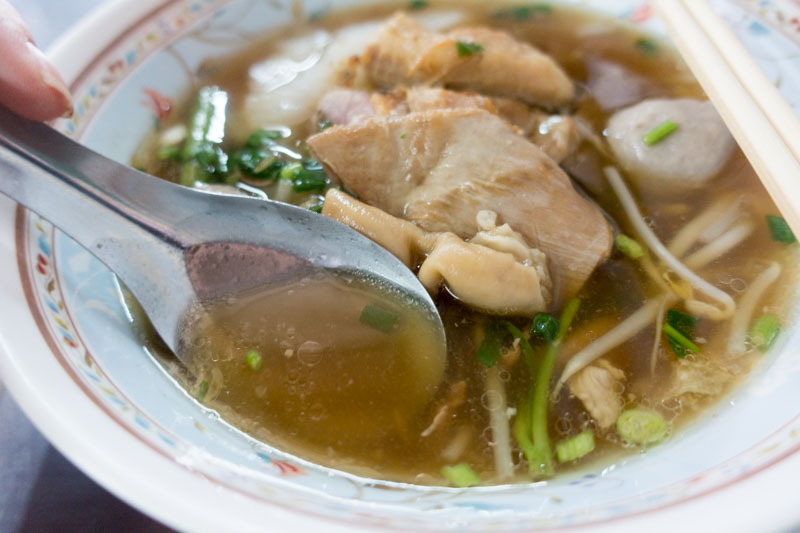 We recommend choosing kway teow to go with your bowl of beef broth. The silky smooth and thin handmade kway teow noodles (which is thinner than Singapore’s version of kway teow) went hand in hand with the light beef broth. This simple bowl of beef noodles was so good that my travelling companion and I polished it off completely. 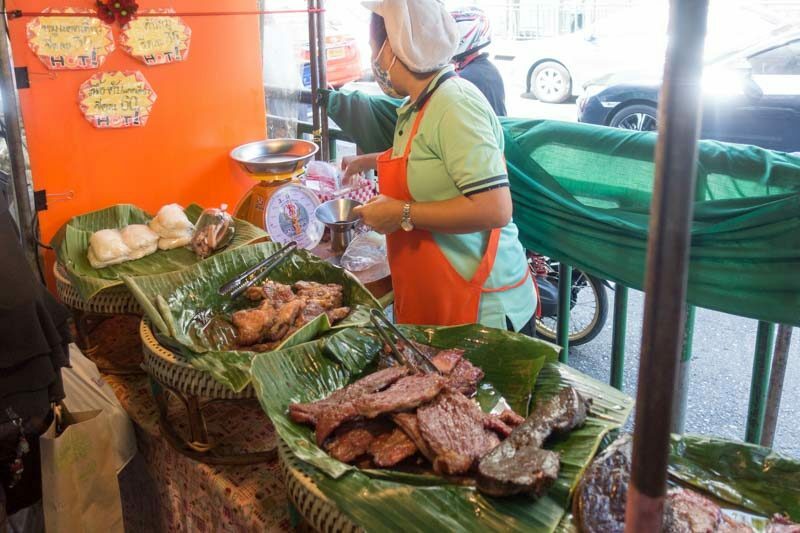 Walking along the main road that’s adjacent to Wang Lang Market, I found myself drooling when I walked by this stall selling barbecued beef and pork. They were just sitting there, in baskets layered with pandan leaves. 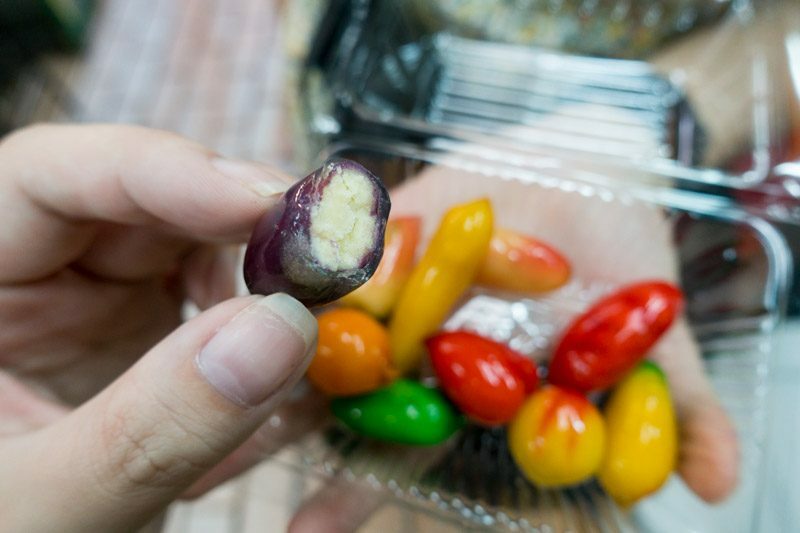 We were told by locals that this was an authentic childhood snack and that this would be something little children would order and munch on as a treat. 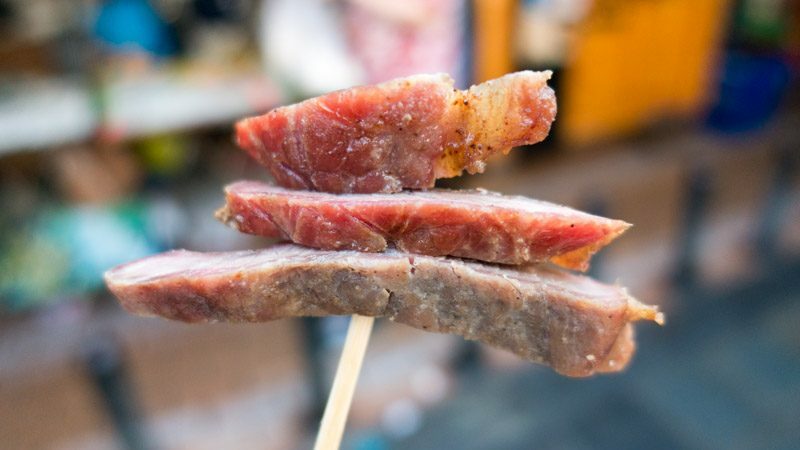 We ordered the Barbecued Beef (THB60) and the vendor sliced it into bite-sized slices, so we could use satay sticks and eat it while walking through the market. You can also try the Barbecued Pork (THB35) if you’re not a big fan of beef. While the barbecued beef was a little tough, I really loved how smoky it was. I could even taste a slight nuttiness and sweetness from grilling. While I’m sure kids would love any form of grilled meat, I wish it had been served with some kind of sauce so it wouldn’t be so dry. What’s not to like about Thai vegetable dumplings? They come with a generous amount of varied fillings, from shredded yam to leafy vegetables, wrapped in a thin layer of starch and either steamed or boiled. Mmm! While there are plenty of stalls along Wang Lang Market which sell dumplings, this particular vendor caught our eye because of how the dumplings were prettily arranged in neat rows on a metal tray. A box of six dumplings went for THB35. 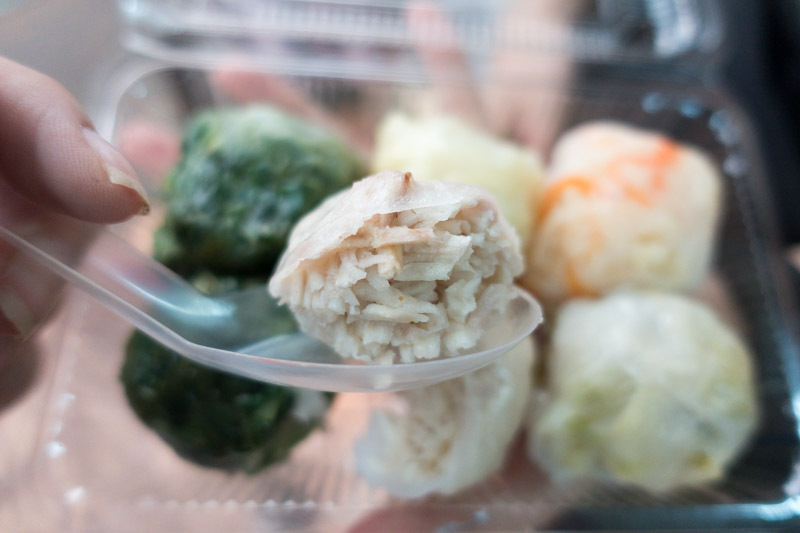 Out of all the dumpling types, such as radish dumplings or vegetable dumplings, I loved the shredded yam dumplings. I know how hard it is to cook yam because of how starchy they can get. The minute I bit into this ball of soft yam slices and tasted how silky smooth they were, I knew it was really well-cooked. The finely shredded yam slices were soft and slightly sugary, and when I continued chewing it, it turned into a velvety paste. 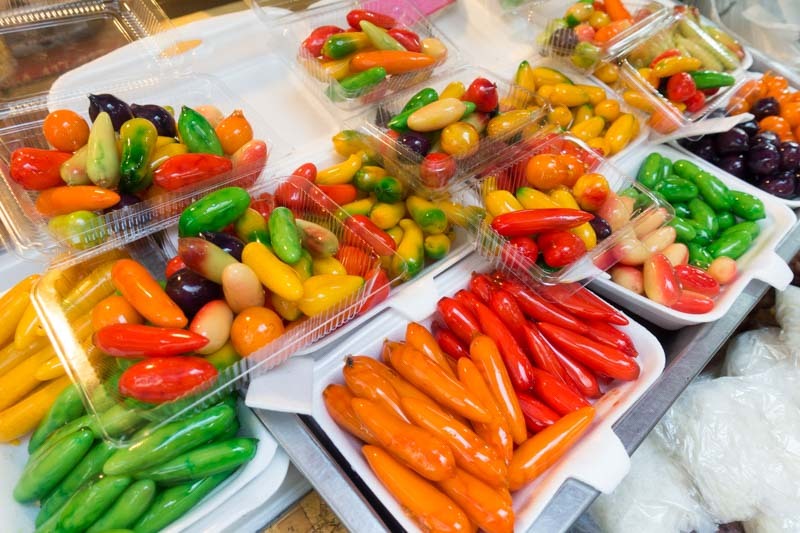 Also known as luk chup, fruit-shaped mung beans are a popular Thai dessert made from split mung bean paste, sugar, coconut milk. They’re then coloured to look like fruits, and coated with jelly. What you might not know is that this cute little eye-catching dessert was once served to Thai royalty! This particular stall we approached sold it in varying sizes for THB20, THB30 and THB50, and we spotted “fruits” and “vegetables” such as cucumbers, mangoes, chilli, eggplants, carrots and oranges. These cute little fruit-shaped desserts smelt sweet and were sticky to the touch. Though the split mung beans were supposed to be ground into a fine paste, it was a little gritty. I quite liked the addition of coconut milk, which made the nutty and sweet dessert fragrant and tropical. 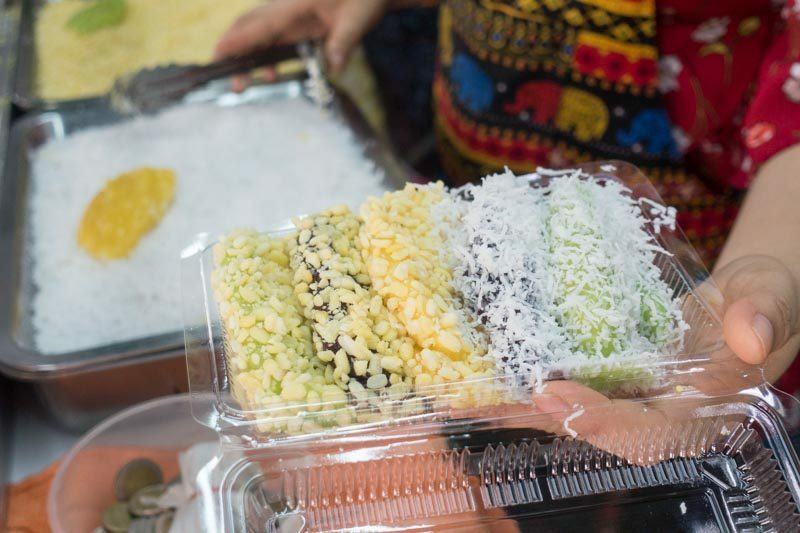 This traditional Thai dessert, also known as tua pap, is a sticky rice cake covered with coconut flakes or chopped mung beans. Typically, it’s stuffed with a bean-paste filling and can come sprinkled with sugar or roasted sesame flakes. 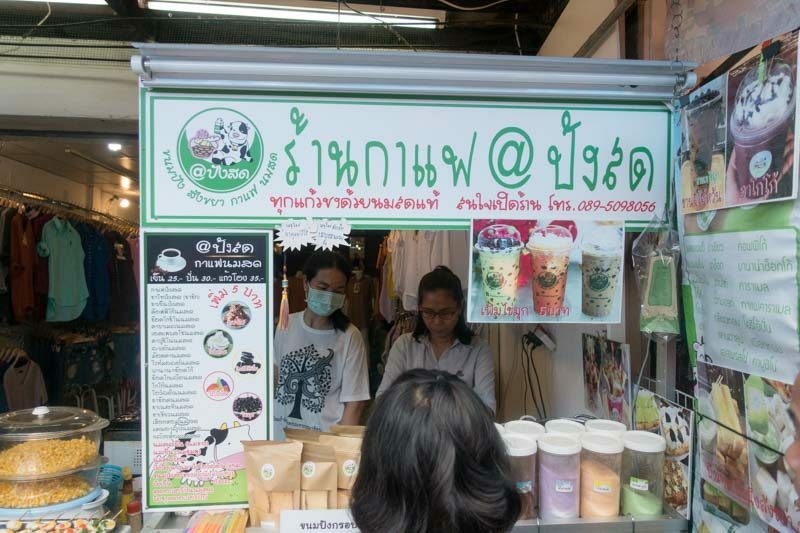 This stall sold a box for THB40 and we chose a mix of both coconut and mung bean flakes. We’re also told that there are different variations to the dessert — some places use black sticky rice, others come with coconut milk, or even serve them as crepes or balls. To me, this tasted like a cross between muah chee and mee chiang kueh. I liked the combination of glutinous rice and crispy mung beans. The sticky rice was doughy and sweet while the mung beans were crunchy and earthy. It reminded me of some classic desserts, like how tang yuans go well with gritty black sesame or peanut paste fillings. 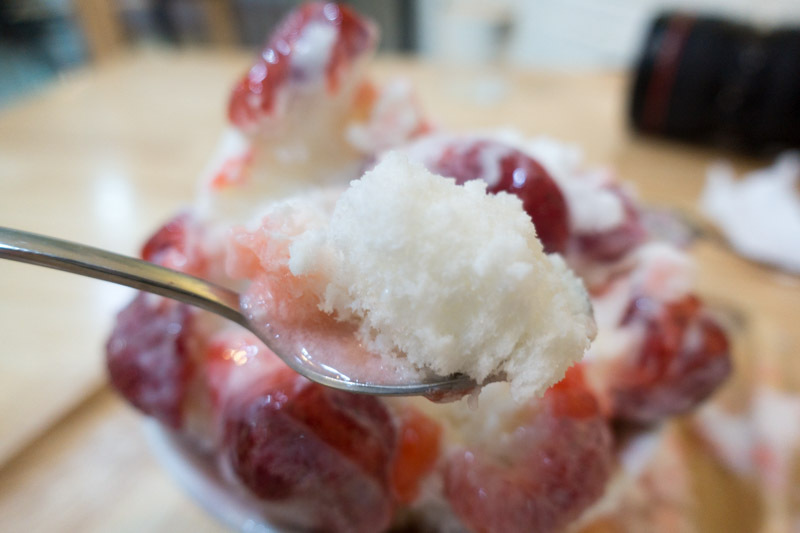 Tucked away in an air-conditioned shop was a quaint café called Amnuay Ice Cream House selling bingsu. Trust us, this was a welcome respite since my travelling companion and I had been trawling the crowded and humid streets of Wang Lang Market. This was just the break we needed: a clean, cosy and more importantly, air-conditioned shop with shaved ice desserts and chairs to rest our legs. We ordered a Strawberry Bingsu (THB159), which came drizzled with condensed milk, strawberry syrup and frozen strawberries. I loved how fine the shaved ice was; it was as light as air and deliciously powdery and soft. I liked that the condensed milk was added right into the shaved ice and it wasn’t overly sweet. 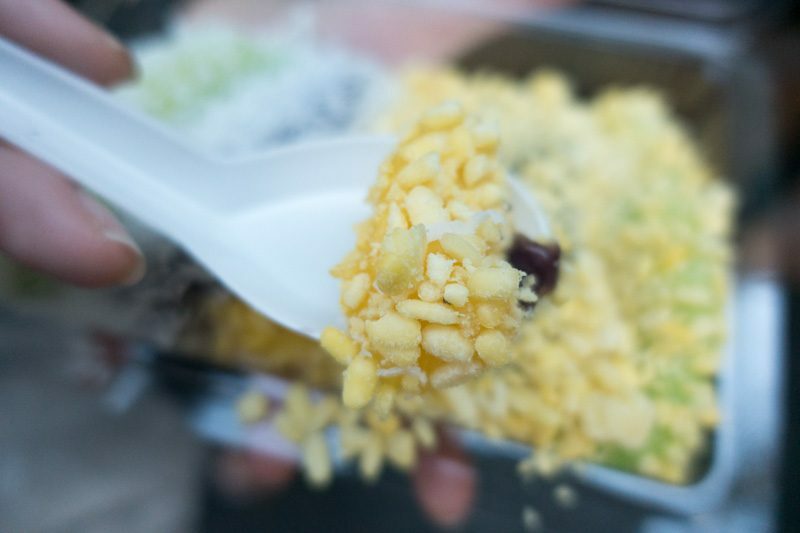 In fact, the condensed milk made the shaved ice smoother. It’s the kind of shaved ice that would meld into a neat hill if I pressed on it lightly. 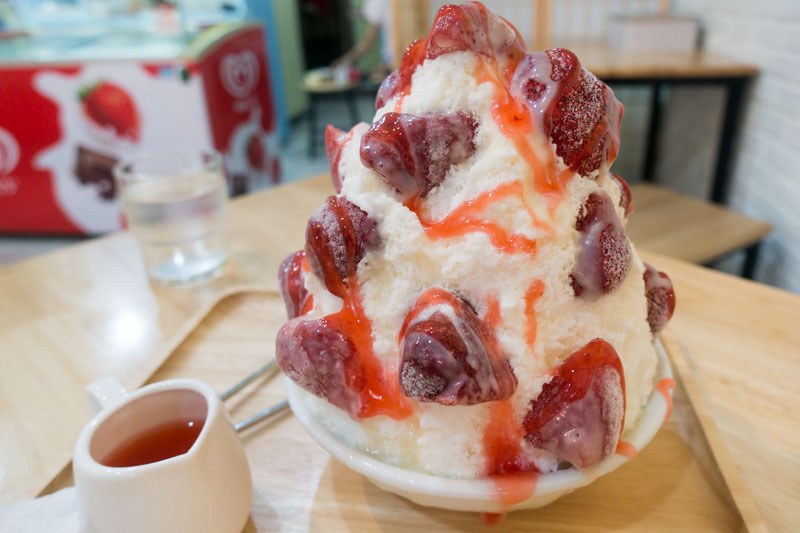 Fair warning that Amnuay Ice Cream House uses frozen strawberries for this dessert, so I got plenty of brain freezes while finishing this bowl of bingsu. Stacked in a delicious pile at this street stall were deep-fried skewers for THB10 to THB20 each. There were fried dumplings, fried pork balls, fried beef balls, fried fish balls, basically fried everything! I grabbed a stick of Deep Fried Pork Balls (THB20) and was delighted to note that they had dipped my skewer in a sticky sweet chilli sauce. 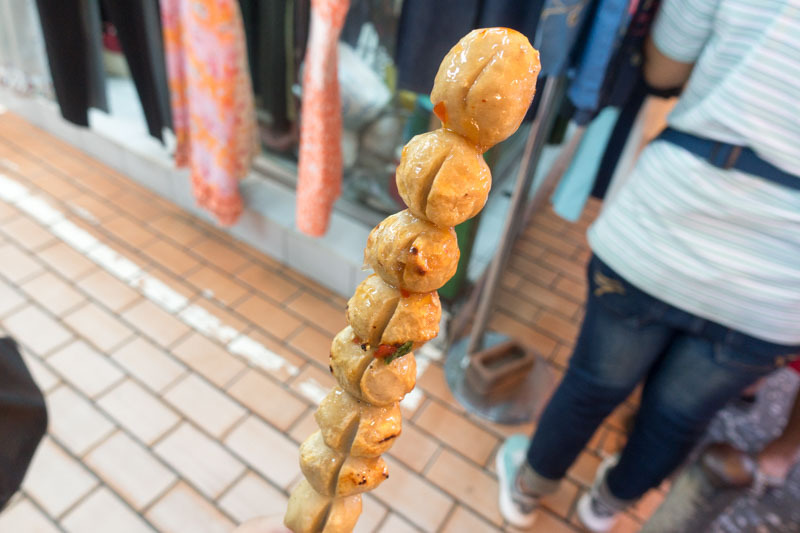 I counted eight pork balls on one skewer! The pork balls were firm and juicy, and the sauce had tinges of garlic, ketchup and sweet chilli. 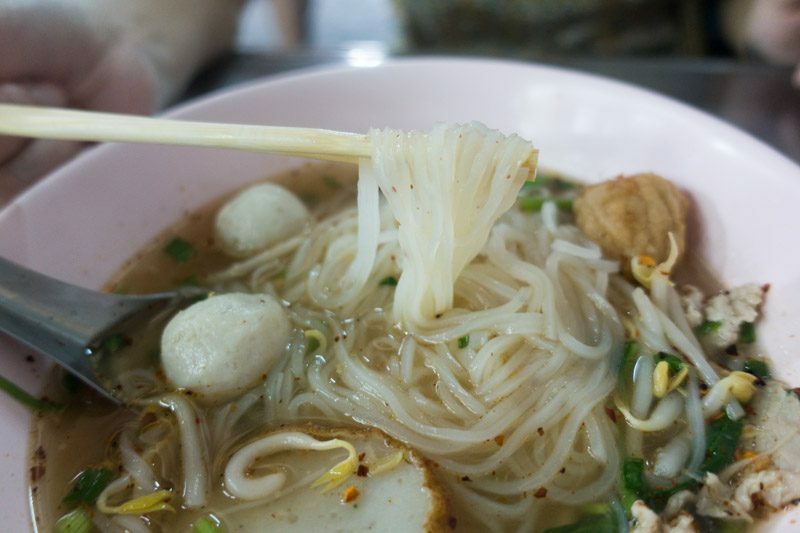 This was the epitome of a Thai street food snack — easy to eat and carry around, simple and absolutely satisfying. The only thing I’d have to say is that the vendor was so generous with the sticky chilli sauce that it dripped all over the place, so come prepared with wet wipes. 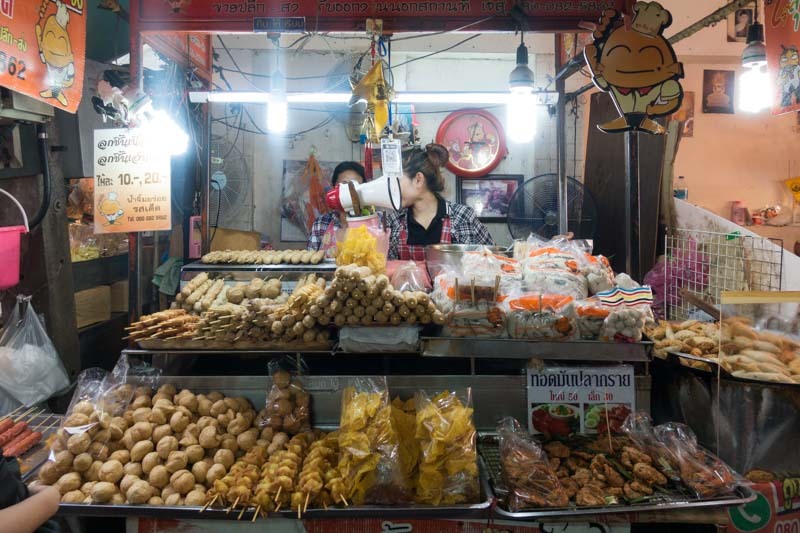 Crowded with locals and packed with authentic Thai street food, Wang Lang Market is a must-visit when you’re in Bangkok. My companion and I had so much fun trawling all the small alleys and discovering all the hidden stalls. What I loved about Wang Lang Market was that it was a day market, so you don’t need to wait till the weekend evenings to visit it. The only drawback for me was the distance — it’s not located within the city and you’d have to travel quite a fair bit by train and boat, but if you’re up for an adventure, why not?